This Special Issue collects results on atmospheric mercury measurements and modelling applications obtained during the EU-funded Project "Global Mercury Observation System (GMOS)" within the 7th framework program. It summarizes original research work about sources, chemistry, transport, and deposition of atmospheric Hg carried out between 2010 and 2015. During the GMOS, a coordinated global observational network for atmospheric Hg was established. As one result the spatial and temporal coverage of atmospheric mercury measurements at remote locations around the globe has been significantly expanded, in particular in the Southern Hemisphere. To date, there are more than 40 monitoring sites participating in the GMOS network involving over 50 research institutions worldwide. In combination with global mercury deposition measurements carried out at a substantial number of these sites, this unprecedented data base has supported the development and validation of both regional and global atmospheric Hg models. Research work summarized in this Special Issue has strong ties to the UNEP Global Partnership on Atmospheric Mercury Transport and Fate Research (UNEP F&T), the Task Force on Hemispheric Transport of Air Pollutants (TF HTAP) of the UNECE-LRTAP convention, and GEO Task HE-02: Tracking Pollutants related to Hg and POPs as well as the Arctic Monitoring and Assessment Program (AMAP). The manuscripts within this Special Issue have been selected under three main topic cover issues concerning (a) aircraft Hg measurements focusing on vertical profiles of Hg concentrations over Europe discussing influences of industrial emission sources on Hg levels; (b) atmospheric mercury measurements at ground-based monitoring sites globally distributed at high altitude and at sea level locations in the Northern and Southern hemispheres, as well as in the equatorial area highlighting seasonal, annual, and spatial changes of Hg levels and total wet deposition fluxes; and (c) regional and global scale modelling applications and results highlighting the atmospheric mercury pattern and process, deposition, and source apportionment. We show the first mercury profile measurements over Europe since 1996. Besides gaseous elemental mercury (GEM) and total gaseous mercury (TGM), the gases CO, SO2, NOx, and O3 were measured from aboard a research aircraft over four European locations. Compared to the boundary layer, the concentration of GEM and TGM in the free troposphere was 10–30% lower. Inside the individual layers no vertical gradient was apparent. Combined with CARIBIC data, a unique profile from 0.4 to 10.5 km is provided. We conducted a multi model study to investigate our ability to reproduce the vertical distribution of mercury in the atmosphere. For this, we used observational data from over 40 aircraft flights in EU and US. We compared observations to the results of seven chemistry transport models and found that the models are able to reproduce vertical gradients of total and elemental Hg. Finally, we found that different chemical reactions seem responsible for the oxidation of Hg depending on altitude. By exploiting the photocatalytic properties of electrospun titania nanofibers, a novel conductometric sensor was designed and fabricated to entrap and detect GEM in air. Such a sensor was able to work at room temperature and was highly sensitive to elemental mercury. Since it is composed of titania and gold nanoparticles, it seems to be robust and resistant to common solvents and VOCs in the air. This paper presents 4 years of total gaseous mercury data obtained from measurements made at the Cape Verde Atmospheric Observatory, a subtropical site in the Atlantic Ocean. The data show a clear decreasing trend in the overall concentrations but in air from sub-Saharan Africa the trend is less significant and the data more variable. We attribute this result to an influence from artisanal small-scale gold mining in this region, a source for which there is uncertain information. The study provides a complex analysis of processes governing Hg fate in the atmosphere involving both measurement data and simulation results of chemical transport models. Evaluation of the model simulations and numerical experiments against observations allows explaining spatial and temporal variations of Hg concentration in the near-surface atmospheric layer and shows possibility of multiple pathways of Hg oxidation occurring concurrently in various parts of the atmosphere. 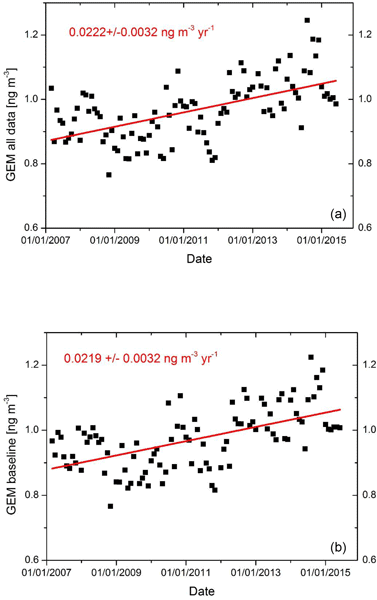 The results on total mercury (THg) wet deposition flux obtained within the GMOS network have been presented and discussed to understand the atmospheric Hg cycling and its seasonal depositional patterns over the 2011–2015 period. The data set provides new insight into baseline concentrations of THg concentrations in precipitation particularly in regions where wet deposition and atmospheric Hg species were not investigated before, opening the way for additional measurements and modeling studies. Currently the Cape Point GAW GEM record is a very sought-after data record for international modelers and scientist alike, as the data set of 20 years represents the longest record in the Southern Hemisphere (SH). CPT was the only monitoring site on the African continent and one of eight GMOS ground-based monitoring sites located in the SH. The increasing Hg trend observed at CPT is of global importance as treaties such as the Minamata Convention on Mercury is there to combat Hg pollution. Biomass burning (BB) releases of Hg, usually considered to be Hg(0), are a significant global source of atmospheric Hg. However there is experimental evidence that a fraction of this Hg is bound to particulate matter, Hg(P). This modelling study shows how increasing fractions of Hg(P) reduce the availability of Hg to the global pool, raising Hg exposure for those regions characterized by high BB, with implications for the sub-Arctic and also rice-growing areas in South-East Asia. Atmospheric deposition is an important pathway by which Hg reaches marine ecosystems, where it can be methylated and enter the base of food chain. High resolution numerical experiments has been performed in order to investigate the contributions (sensitivity) of the Hg anthtropogenic emissions, speciation and atmospherical chemical reactions on Hg depositions over Europe. The comparison of wet deposition fluxes and concentrations measured on 28 monitioring sites were used to support the analysis. Hg ∕ SO2, Hg ∕ CO, and NOx ∕ SO2 emission ratios (ERs) in the plume of the coal-fired power plant (CFPP), Lippendorf, near Leipzig in Germany, were determined in August 2013. GOM fraction of mercury emissions was also assessed. Measured Hg ∕ SO2 and Hg ∕ CO ERs were consistent with the ratios calculated from annual emissions in 2013 reported by the CFPP operator. The NOx ∕ SO2 ER was somewhat lower. GOM fractions of ~ 40 % of CFPP mercury emissions in current emission inventories are overestimated. Within the EU-funded project, Global Mercury Observation System (GMOS) airborne mercury has been monitored at the background Råö measurement site on the western coast of Sweden from May 2012 to the end of May 2015, the following mercury species/fractions were measured: gaseous elemental mercury (GEM), particulate bound mercury (PBM) and gaseous oxidised mercury (GOM). Evidence that a significant part of the GOM measured at the Råö site has been formed in the free tropospheric air is presented. An assessment of current and future emissions, air concentrations and atmospheric deposition of mercury worldwide is presented on the basis of results obtained during the performance of the EU GMOS (Global Mercury Observation System) project. Emission estimates for mercury were prepared with the main goal of applying them in models to assess current (2013) and future (2035) air concentrations and atmospheric deposition of this contaminant. This work presents atmospheric Hg concentrations recorded within the GMOS global network analyzing Hg measurement results in terms of temporal trends, seasonality and comparability within the network. The over-arching beneﬁt of this coordinated Hg monitoring network would clearly be the production of high-quality measurement datasets on a global scale useful in developing and validating models on different spatial and temporal scales. This paper presents a multi-year record of atmospheric gaseous elemental mercury (Hg(0)) at Dumont d’Urville (DDU) on the East Antarctic coast. This record reveals particularities that are not seen at other coastal Antarctic sites, likely due to the more frequent arrival of inland air masses at DDU than at other coastal sites, and to the influence of oceanic air masses. This study confirms the influence of processes observed inland on the cycle of atmospheric mercury at a continental scale. While the Arctic has been extensively monitored, there is still much to be learned from the Antarctic continent regarding the processes that govern the budget of atmospheric mercury species. We report here the first year-round measurements of gaseous elemental mercury (Hg(0)) in the atmosphere and in snowpack interstitial air on the East Antarctic ice sheet. The striking reactivity observed on the Antarctic plateau most likely influences the cycle of atmospheric mercury on a continental scale.